In the days of the transatlantic steamliners, the voyage from Europe to the New World took two weeks and consequently, people went through most of their food supplies before they even set foot on American soil. Today, a mere 8 hours (or 72, if your baggage is checked in with Air Canada) is all it takes to switch continents, and thanks to a generous weight allowance, I had the chance to fill my bags with lots of stuff prior to leaving Switzerland. So what does one pack into one's bags to brave an estimated 6 months in Canada? Keep in mind that this is not exactly a third world country, although I did bring a 14-function Swiss army knife just in case (hey, it saved MacGyver many times!). 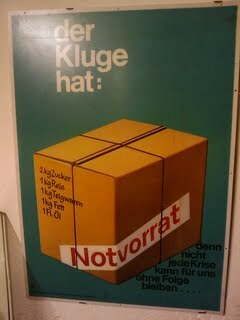 With 24 hour pharmacies taking care of the most obvious emergencies, I could focus my attention on the genuinely Swiss virtue of Notvorrat: When winter (nuclear or otherwise) strikes, I can fall back on several kilos of chocolate, a 110V raclette oven and a bottle of heart-warming Kirsch. To "blend in" with my surroundings, I resort to Candida toothpaste promising snow-white teeth, while Rohner socks will keep my feet warm in the harshest of climates. And although it may be hard to believe, the old adage "One man's trash is another man's treasure" does hold true for the Swiss as well, which is why I am able to report that a neglected tube of Thommy mustard has found a new home through my office's infamous Swiss connection.